Kirobo is set to blast off from Japan for the International Space Station in August, then wait for Japanese astronaut Koichi Wakata to arrive in November or December and take part in the first robot-human conversation in space. TOKYO (Bloomberg) -- Toyota Motor Corp. said a robot it co-developed will have the first human-robot conversation in space as part of a project to make machines that can interact with and assist people living alone. "This is one small step for me, but one giant leap for robots," the 13-inch-tall humanoid robot named Kirobo said at a briefing in Tokyo this week after being unveiled to the theme song of Astro Boy, an animation series about robots living among humans. Voice-recognition technology developed by the carmaker will enable Kirobo to remember human voices and respond to them in Japanese, according to Toyota. The world's largest automaker will use findings from the project to improve the partner robots it makes that can perform tasks such as housework and assisting people who have difficulty walking. "Japanese people are more comfortable with the idea of living and communicating with robots, because that's a popular scene in manga," University of Tokyo Associate Professor Tomotaka Takahashi said, referring to Japanese comics. "In about 15 years, we want to see a society where everyone is living with a personal robot." University of Tokyo researchers and Dentsu Inc., Japan's biggest advertising agency, are working with the carmaker on the project. 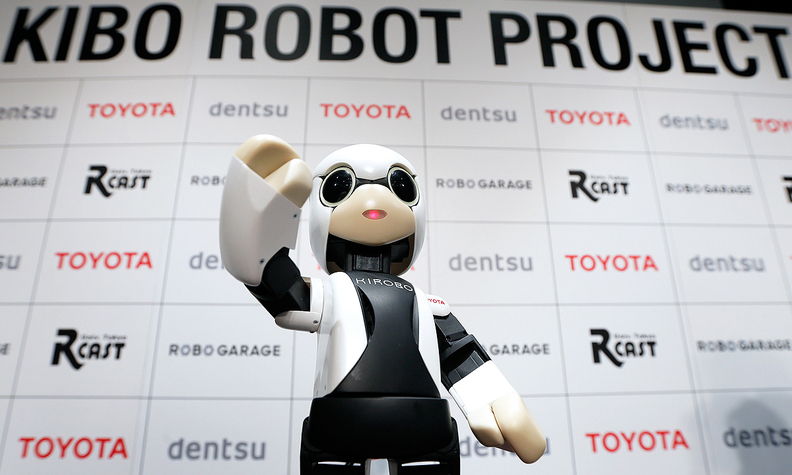 Toyota is developing its partner robots partly because Japan has one of the world's fastest-aging populations. One in every four people in the country will be older than 65 in 2014, compared with 9.6 percent in China and 14 percent in the United States, according to data compiled by the U.S. Census Bureau. The carmaker has been developing industrial robots since the 1970s to help cut costs and improve quality by automating manufacturing tasks such as welding and painting. Kirobo is set to blast off from Japan for the International Space Station in August aboard the Kounotori 4 cargo spacecraft. The robot will then wait for Japanese astronaut Koichi Wakata to arrive in November or December and take part in the first robot-human conversation in space, according to Toyota. Kirobo is scheduled to return to earth in December 2014. "We want people to dream of a society where we live with robots," Fuminori Kataoka, general manager of Toyota's product planning division, said. "I'm very excited."